Hang the Ant Moat where you would normally hang your hummingbird feeder. 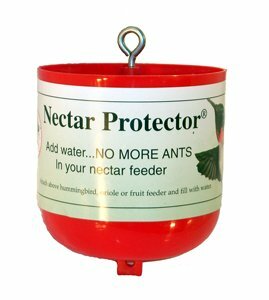 Hang your feeder from the bottom of the Ant Moat. Fill the Ant Moat with water. Now crawling insects, especially ants since they are attracted to sugar, cannot get to your feeder because Ants Can't Swim! This ant deterrent holds 300% more than the next largest competitor. Easy to clean concave bowl. Less maintenance as it holds 3 times more! Strong - holds even the largest feeders!.